Summer at Settlement is a little bit of everything. Our Summer Session runs for six weeks, from June 18 to August 30. Individual instruction in all instruments is offered, along with numerous ensembles and classes and week-long summer camps for specific subject areas. For students of all ages, the Summer Session can serve as an introduction to Settlement’s programs or as a continuation of studies from the rest of the year. From chamber music to rock bands and recording studios, students will deepen their focus and expand their interests over the summer. The African Rhythms Camp offers students the opportunity to experience African percussion instruments in an ensemble setting, as well as the role of music in various African cultures. Students will learn basic playing techniques, traditional rhythms, and improvisation. No prior experience necessary. Camp concludes with a final performance on Friday. June 21: 6:30 – 8:30 p.m. / June 22: 10 a.m. – 3 p.m. / June 23: 1 – 4 p.m.
Students will have a unique opportunity to experience an intense and fulfilling three days working with master woodwind faculty from Settlement Music School. Students will be placed in smaller chamber ensembles, work on level appropriate repertoire, receive instruction by other coaches, hear a live performance of professional woodwind players, participate in other musical activities, and give a concert on Sunday. June 21: 6:30-8:30 p.m. / June 22: 10 a.m. – 3 p.m. / June 23: 1 – 4 p.m.
Students will have a unique opportunity to experience an intense and fulfilling three days working with master Brass faculty from Settlement Music School. Students will be placed in smaller chamber music ensembles, work on level appropriate repertoire, participate in other musical activities and give a concert on Sunday. Older students will participate in a college audition preparatory class. Monday – Thursday: 9 a.m. to 3 p.m. / Friday: 9 a.m. to 2 p.m.
All string players are welcome who can read music and be secure in first position. Cellists should know extensions in first position. This is camp for those students who are younger players who have not had much chamber music experience. Intro to Suzuki: Pre-Twinkle Play! June 24 – June 29, 10 a.m. to 11 a.m.
July 29 – August 2, 10 a.m. to 11 a.m.
Come join us for an exciting, fun-filled week exploring Suzuki style musical learning through play and discovery. Students will learn musical concepts through games, movement, and expression, as well as have a chance to try the violin and cello through an exploratory instrument petting zoo. Parents/caregivers are encouraged to join us! No materials or instruments are required. Join us for a week-long adventure into the world of Ukulele. This class is for beginner to intermediate levels. No previous musical experience is necessary. For students who have played one year in their school or more. Students will spend the morning in a warm-up class learning breathing exercises, posture, tone production, and technique. Next, students will be introduced to basic music theory and musicianship. The students will then finish the day playing chamber music with their peers. Students will return to their large ensembles in the fall as stronger players. The camp will culminate in a concert on Friday afternoon at the Branch. The camp welcomes students who play trumpet, trombone, tuba, horn, baritone, euphonium, flute, oboe, clarinet, bassoon, and saxophone. For students who play drums, electric guitar, bass, keyboard, wind, brass, and string instruments. 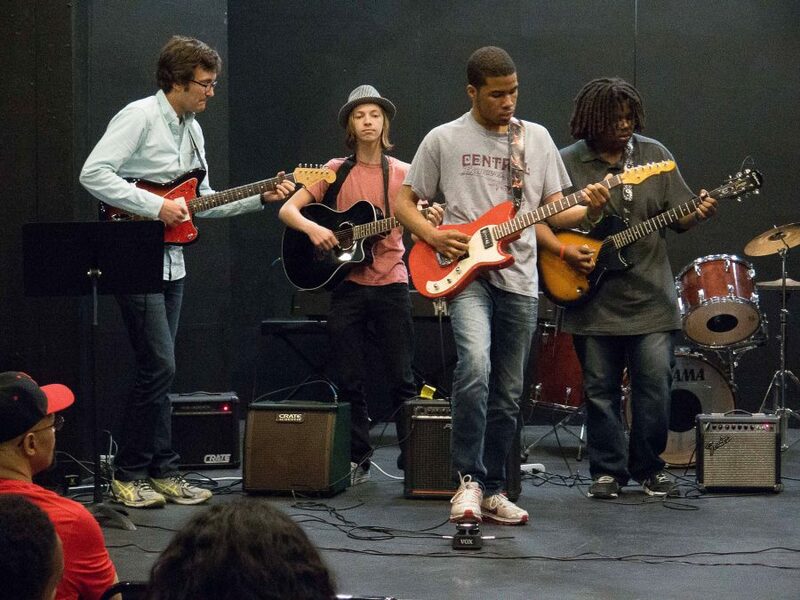 The camp places students in small jazz ensembles where each student will learn harmonic language, technique, improvisation, history, and composition through playing music with their peers. The student will leave the camp with stronger improvisation and ensemble playing skills. The camp will conclude with a concert on Friday afternoon at the Branch.